"His heart can't handle our gravity… It's too risky!" 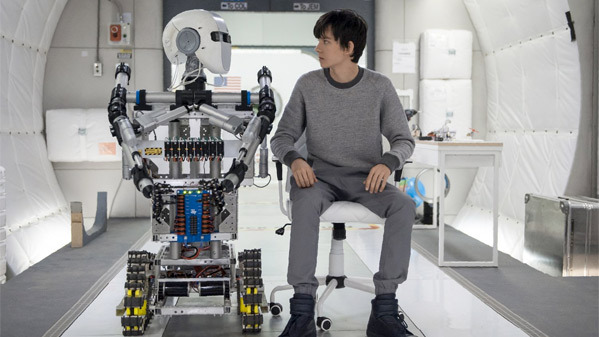 STX has released a new trailer for the film The Space Between Us, arriving in theaters December, about the first boy ever born on Mars who returns to Earth and must experience the planet (and young love) for the first time. Perfect timing to launch this trailer, with Elon Musk discussing his plans for colonizing Mars. Asa Butterfield plays the boy, who at age 16 finally returns to Earth. The main aspect of this movie is the love story angle and he falls for a "street smart girl in Colorado named Tulsa", played by Britt Robertson, but has his own physical struggles. The cast includes Carla Gugino, Gary Oldman, BD Wong, Janet Montgomery, and Jenny Gabrielle. As much as I want to be excited to see this, it just looks so schmaltzy and goofy. I hope to be proved wrong when it opens. You can still watch the first official trailer for The Space Between Us here, to compare the footage. It will be interesting to see how they explain why he is able to walk under Earth's gravity. It'll probably be some lame robot exercise during his flight from Mars. I want to see a video of Neil deGrasse Tyson explaining everything wrong with this movie, that'll be an interesting follow up.